This method leads to the destruction of asbestos fibers, and thus eliminates the carcinogenic properties of materials containing asbestos. It involves keeping granulated mass obtained e.g. from powdered asbestos-cement roofing material, mixed with additives in appropriate proportions, at high temperatures. The process is exothermic and is carried out in rotary kilns used in the production of cement. The resulting product is a kind of clinker which does not contain asbestos fibers. The technology examined in laboratory conditions was tested and confirmed in the semi-technical conditions in the Department of Glass and Building Materials in Krakow of the Institute of Ceramics and Building Materials in Warsaw, and it was assessed positively. The product obtained by means of this technology may be used (marketed) in a number of industries, which reduces the cost of the processing of asbestos and its derivatives into an asbestos-free product. The current handling of asbestos and its derivatives involves removing of the asbestos-cement roofing material and burying it in special dumping grounds. That is not liquidation of asbestos, but its mere removal from one place to another, where it can still enter the environment. The patented technology presented in this article completely eliminates asbestos and its negative impact on the environment, including in particular a possible development of cancer in humans. Asbestos, in particular chrysotile but also crocidolite, are minerals considered carcinogenic. A connection was found between the number of tumors, especially lung cancers in humans, and the presence of chrysotile in the environment, in particular in the air . Work on asbestos disposal with thermal methods has been carried out by many researchers since the 1950s  and accelerated in 1990-2010 [3-12]. Attempts have also been made to synthesize silicone polymers from chrysotile . Some researchers have tried to destroy chrysotile using chemical reagents [14,15] or gases. Interesting results were obtained by researchers attempting to use chrysotile for the production of ceramic products [16,17]. Published studies were conducted in various thermal conditions, usually without additions to the processed eternit, in particular without other industrial waste hazardous to the environment, which would allow the attempt to eliminate not only chrysotile, but also other waste [18,19]. Prior to the experiments leading to the elimination of asbestos, mineralogical tests of eternit were performed. Eternit is a cementasbestos product which was used in Poland in the amount of many millions of tons to cover roofs of houses. X-ray phase analysis (Figure 1) showed that besides chrysotile (asbestos), eternit contains mainly portlandite with admixture of hydrogrossular, calcite and vaterite. The content of chrysotile in this eternit is up to 20%, as demonstrated by planimetric microscopic analyzes carried out using polarized light microscopy. Figure 1: X-ray pattern of eternit used in the experimental processes. The experimental processes leading to elimination of asbestos in eternit were carried out in three stages. Eternit transformation was carried out without additives, at high pressures and temperatures. The result of those experiments, carried out at the temperatures of 400-1350°C and pressure of 4-6 GPa, was transformation of eternit components to crystalline silicates and aluminosilicates, with complete disappearance of chrysotile diffractions (Figure 2). 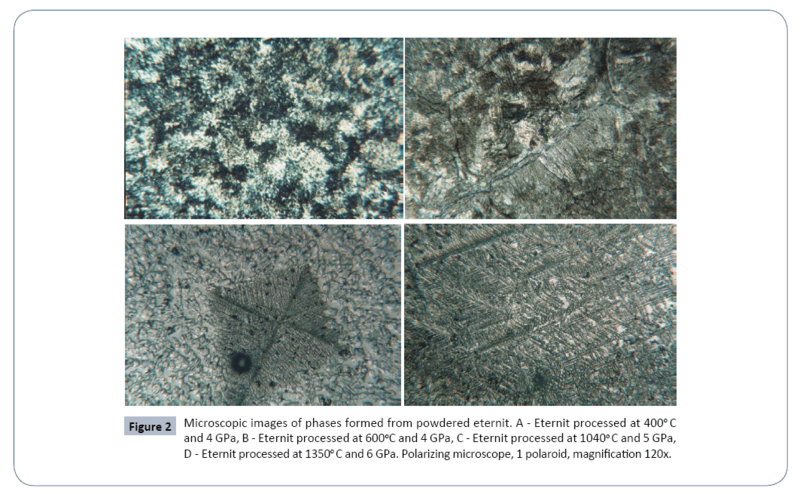 Figure 2: Microscopic images of phases formed from powdered eternit. A - Eternit processed at 400°C and 4 GPa, B - Eternit processed at 600°C and 4 GPa, C - Eternit processed at 1040°C and 5 GPa, D - Eternit processed at 1350°C and 6 GPa. Polarizing microscope, 1 polaroid, magnification 120x. At this stage of the research, the transformation of eternit (and especially chrysotile) was carried out with various additives (fluxes), without the use of high pressures, but at different temperatures. The experiments were aimed at reducing temperature and saving energy in the transformation process. This synthesis created products with different crystallinity (Figure 2) that were completely devoid of chrysotile and contained mainly silicates and aluminosilicates (Figure 3). Figure 3: Example of an X-ray diffraction pattern of a product synthesized at the temperature of 800°C and pressure of 4 GPa, transformation time-120 seconds. Knowledge and data obtained in previous experiments formed the basis for the transformation of eternit on a semitechnical scale. The eternit powder was mixed with additives. Transformations were carried out at high temperatures, first in laboratory conditions and then on a semi-technical scale. They were conducted in the Experimental Station of Department of Glass and Building Materials in Krakow, ul. Cementowa 8, 31-983 Kraków. The technology described below is protected by patent No. 215074, “Method of utilization of asbestos and/or asbestoscontaining products”, granted by the Patent Office of the Republic of Poland on November 6, 2013 (Figure 4). Transformations of eternit, in particular chrysotile asbestos, were done in a set consisting of a mixture of eternit and an additive (waste from coal mines). In accordance with the assumptions, the degree of asbestos transformation in the set was controlled based on the disappearance of dhkl diffractions typical for chrysotile on X-ray diffraction patterns. Chrysotile is the primary asbestos mineral in the processed material. 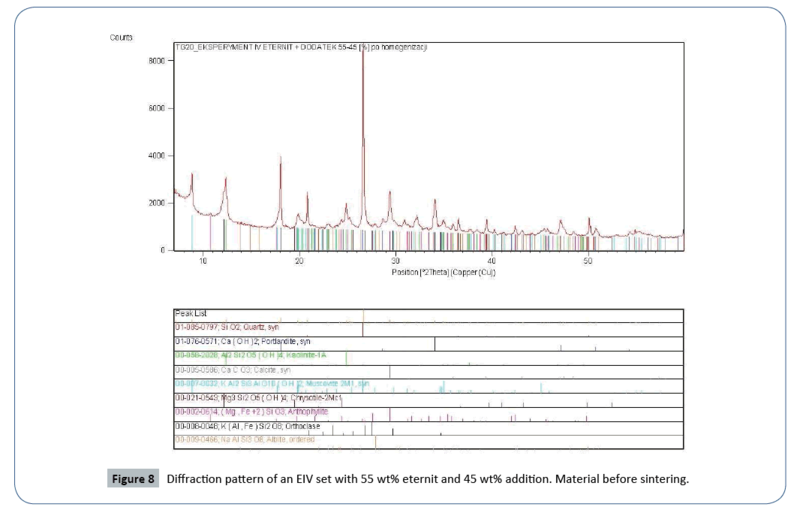 A sample of the EIV set with a fixed composition, sintered in a rotary kiln at the OSiMB Experimental Station, was analyzed.Observations of transformation products using a scanning microscope were also carried out. Figure 4: Microscopic images of phases formed from powdered eternit mixed with potassium feldspar. A - eternit+ flux, temperature 400°C, B - eternit+flux, temperature 800°C. The technological process was carried out on grated eternit mixed with powdered additive from a coal waste dump. 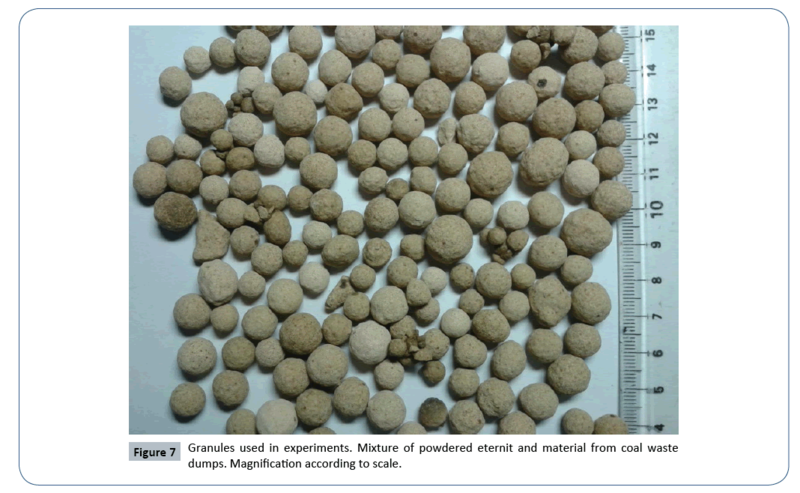 Both powdered materials were prepared in the form of dried granules (Figure 4). The dry granulate was poured into a mazut-operated rotary kiln. During the rotation of the kiln, the granules shifted, passing through successive heating zones, including one with the temperature exceeding 1000°C, for a period of time long enough for the material in granules to plasticize, but not to melt. Phase composition tests of the granules obtained after sintering the mixtures (synthetics) were performed using an X-ray diffractometer by PAN analytical, system X'PERT PRO MPD. Changes in the phase composition of the output set and of samples after heat treatment in the rotary kiln were analyzed with particular focus on the potential presence of asbestos, especially when comparing changes in the intensity of the line typical for chrysotile, d=7.30 Å (angle 2θ CuK 12.12°).Granules were subjected to X-ray phase analysis before the heat treatment (Figure 5). The analysis confirmed presence of chrysotile in the sample. Next, the X-ray phase tests were carried out on granules after thermal transformation in a rotary kiln. The granules were removed from the kiln and tested at predetermined time intervals to determine optimal temperature conditions and kiln rotations during transformation of the chrysotile asbestos in the sintering zone (Figure 6). 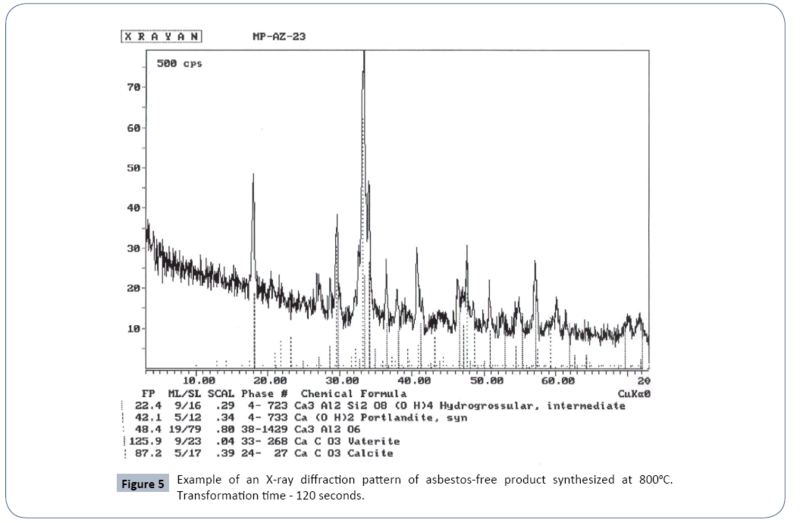 Figure 5: Example of an X-ray diffraction pattern of asbestos-free product synthesized at 800°C. Transformation time - 120 seconds. Figure 6: Patent granted by the Patent Office of the Republic of Poland for the method of utilization of asbestos and/or asbestos-containing products. Full process control documentation for transformation of eternit with coal waste additive by sintering in a rotary kiln confirms that asbestos reacted completely with the coal waste additive to form new aluminosilicate connections mainly of gehlenite, as well as magnesium calcium orthosilicates and pyrosilicates. Also identified are peaks with dhkl values typical for CaSiO3 wollastonite. In the sintering products of the EIV set, the lines typical for chrysotile, i.e. diffraction of d=7.30 Å (angle 2θ Cu Kα12.12°), were gone-regardless of the temperature in the sintering zone at a temperature above 1000°C, and at 2 rotations of kiln per minute. In the tested set the constituents of the coal waste, i.e. clay minerals and quartz, reacted with asbestos minerals, forming aforementioned aluminosilicate connections (fading quartz lines, d=3.34 Å (angle 2θ Cu Kα 26.67°) and the kaolinite line of d=7.15 Å (angle 2θ Cu Kα 12.37°). The results of phase tests conducted using the XRD method were confirmed by detailed observations of the structure of sintered granules, which were carried out with scanning microscopy at various magnifications. In contrast to non-sintered samples (Figure 7), no asbestos fibers were observed in any of the samples obtained after sintering the material (granules) (Figures 8-10). Figure 7: Granules used in experiments. Mixture of powdered eternit and material from coal waste dumps. Magnification according to scale. Figure 8: Diffraction pattern of an EIV set with 55 wt% eternit and 45 wt% addition. Material before sintering. Figure 9: Diffraction pattern of the EIV set after processing at a temperature above 1000°C at the kiln rotation speed of 2.0 rpm. Figure 10: Image of the granulate microstructure before the thermal destruction process, visible asbestos fibers. SEM. B - Image of the granulate microstructure after sintering. SEM. C - Image of the granulate microstructure after sintering at higher magnification. SEM. XRD and SEM tests did not show the presence of chrysotile in the granules subjected to sintering in the Stage III study. Other mineral phases identified in processed granules prove that asbestos has completely reacted and disappeared as a result of the described technology of its destruction. 1. Total destruction of the chrysotile asbestos contained in eternit. 2. Elimination of the risk of lung cancer associated with the carcinogenic effect of chrysotile. 3. Leads to elimination of coal waste dumps or other mineral wastes. 4. Obtained product (processed granules) is not useless waste. It can be used in many areas of economy, including as an addition to light concretes. However, appropriate tests should be carried out in this area. Harris LV, Kahwa IA (2003) Asbestos-old foe in 21st century developing countries. Science of the Total Environment 307: 1. Brindley GW, Zussman J (1957) A structural study of the thermal transformation of serpentine minerals to forsterite.American Mineralogist 42:461-474. Jeyaratnam M, West NG (1994) A study of heat-degraded chrysotile, amosite and crocidolite by X-ray diffraction. Annals of Work Exposures and Health 38: 137-148. MacKenzie KJD, Meinhold RH (1994) A glass-bonded ceramic material from chrysotile (white asbestos). Journal of Materials Science 29:2775-2783. Gualtieri AF, Tartaglia A (2000) Thermal decomposition of asbestos and recycling in traditional ceramics. Journal of the European Ceramic Society 20: 1409. 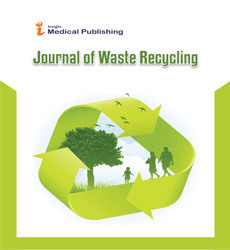 Domka L, Domka L, Kozak M (2001) Utilization of asbestos waste. Physicochemical Problems of Mineral Processing 35:83. Dellisanti F, Minguzzi V, Morandi N (2002) Experimental results from thermal treatment of asbestos containing materials. Geo Acta 1: 61-70. Plescia P, Gizzi D, Benedetti S, Camilucci L, Fanizza C, et al. (2003)Mechanochemical treatment to recycling asbestos-containing waste. Waste Management 23: 209. Âska A (2006) Methods for the disposal of products containing asbestos. Building Materials 11:49. Gualtieri AF, Gualtieri ML, Tonelli M (2008) In situ ESEM study of the thermal decomposition of chrysotile asbestos in view of safe recycling of the transformation product. Journal of Hazardous Materials 156:260. Hashimoto S, Takeda H, Okuda A, Kambayashi A, Honda S, et al. (2008) Detoxification of industrial asbestos waste by low-temperature heating in a vacuum. Journal of the Ceramic Society of Japan 116: 242. Giacobbe C, Gualtieri AF,Quartieri S, Rinaudo C, Allegrina M, et al. (2010)Spectroscopic study of the product of thermal transformation of chrysotile - asbestos containing materials (ACM). European Journal of Mineralogy 22: 535-546. Habaue S, Hirasa T, Akagi Y, Yamashita K, Kajiwara M (2006) Synthesis and property of silicone polymer from chrysotile asbestos by acid-leaching and silylation. Journal of Inorganic and Organometallic Polymers and Materials 16: 155-160. 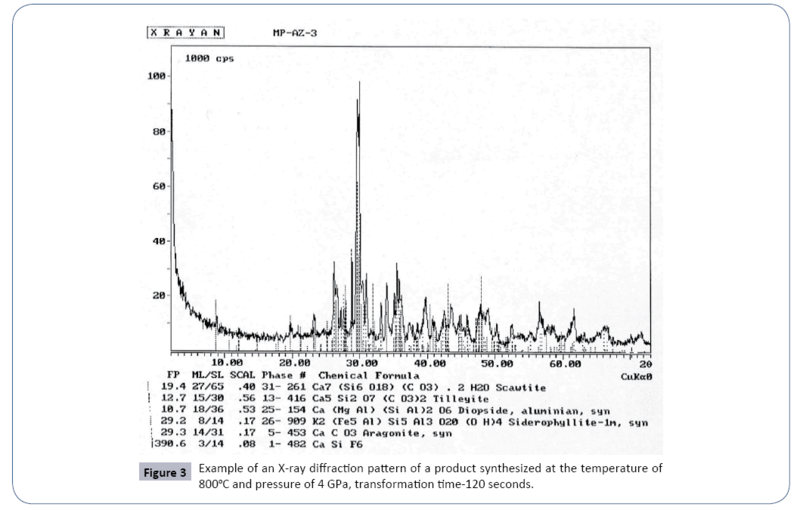 Sugama T, Sabatini R, Petrakis L (1998) Decomposition of chrysotile asbestos by a uorosulfonic acid. Industrial & Engineering Chemistry Research 37:79. Yanagisawa K, Kozawa T, Onda A, Kanazawa M, Shinohara J, et al. (2009) A novel decomposition technique of friable asbestos by CHClF 2-decomposed acidic gas. Journal of Hazardous Materials 163: 593. Âa A, Piotrowski J, Garczorz D (2010) The use of chrysotile asbestos as a raw material for the production of ceramic products with sintered fragments. Ceramic Materials 62: 149. Zaremba T, Kusiorowski R (2011) Possibilities of using eternite in the ceramic industry. Ceramic Materials 63: 294-300. Klimas K (1998) Plasma liquidation of asbestos waste. Geological Review 46: 1235. Gualtieri AF, Cavenati C, Zanatto I, Meloni M, Elmi G, et al. (2008) The transformation sequence of cement-asbestos slates up to 1200°C and safe recycling of the reaction product in stoneware tile mixtures.Journal of Hazardous Materials 152:563.